It is no secret that if HBCU citizens are going to close the wealth gap for their families and institutions, then it will happen through enterprise. Fifteen of the twenty wealthiest people in the world on Bloomberg’s Billionaires Index have their sources of wealth noted as self-made. A term that many would argue could have a broad interpretation. For instance Jeff Bezos, founder of Amazon with a net worth of $33.1 billion, received a $300 000 loan from his father to launch his company. A reality that is unimaginable by well over 95 percent of HBCU citizens and their families. 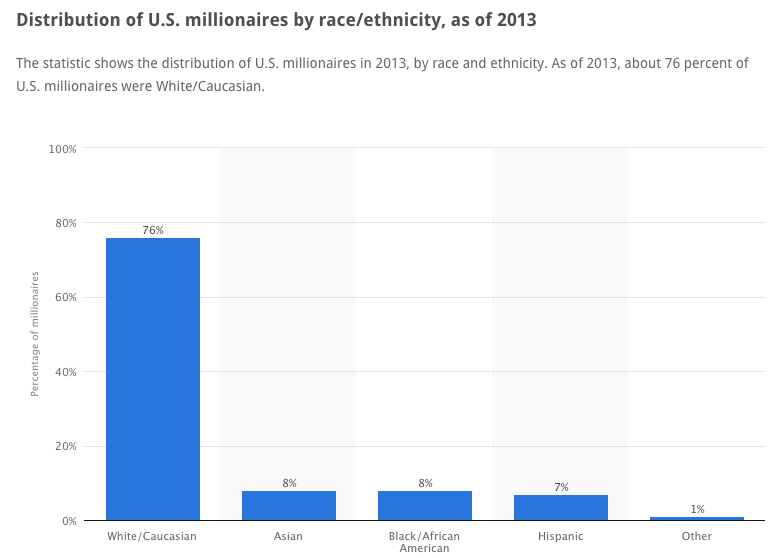 According to Statista (graph below), of the 9.63 million households in America that are millionaires, excluding their homes, only 8 percent are African American or 770 400. With approximately 15.5 million African American households that means the chance you have of having parents who can write you a $300 000 check is approximately 5 percent at best. However, having familial money is not everything when it comes to startups today. It helps a lot definitely, but there are other variables that are vital as well. What is the ecosystem for business like in your city? Is there a cluster of entrepreneurs? The old adage that iron sharpens iron would be very poignantly applied here. Part of Silicon Valley’s success is because of the number of ideas flying around nonstop. The hardest thing to find in Silicon Valley is someone who is not an entrepreneur, but a recent article in Popular Mechanics suggest that there are a budding number of hot spots across the country for startups. A term that should not just be confused with technology companies, although it has become almost synonymous with them and Silicon Valley. The first is St. Louis, Missouri which ranked number one overall in the article, home of Harris-Stowe State University. Recent reports have Harris-Stowe just above 1 700 students. 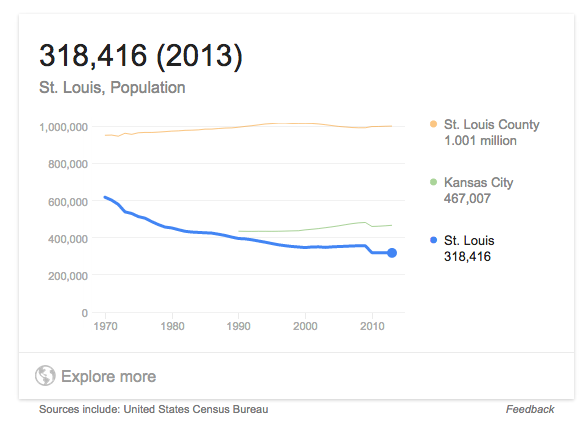 The city has been struggling to revive its population (graph above) over the past 45 years, with an almost 50 percent decline in population this new startup boom could be just what it needs. So how is the city turning itself around? By returning to its entrepreneurial roots and reinventing itself or as Popular Mechanic editors put it, “St. Louis is a place where people come to make things—always has been. It was founded by enterprising fur traders and thrived on the wealth of railroad barons and beer moguls.” After the Great Recession that saw the city’s flagship company Anheuser-Busch sale itself off, the city took a step back and reinvented itself, “From 2011 to 2013 the ecosystem supporting entrepreneurs more than doubled in size with the launch of eight makerspaces (shops with tools like 3D printers and laser cutters), accelerators (early-stage investors and mentors), and coworking spaces (a shared office for startups, with low rent)”. The city and St. Louis Chamber of Commerce is really getting behind the movement, backing such startup hubs as T-Rex, which revitalized an 80 000 square feet 1898 building that gives startups a place to put down their initial roots. One of T-Rex’s tenants that Popular Mechanics highlights is from a local university, “Betaversity, the brainchild of biology student Blake Marggraff, 22, and two of his associates. The company’s main product is the BetaBox Mobile Prototyping Lab, a work space with 3D printers, laser cutters, CNC routers, and more—all cleverly wedged into a shipping container.” It appears that the Gateway Arch is shining itself up for its second act. Number five on Popular Mechanics list of best startup cities in America was Baltimore, Maryland. It is home to three HBCUs. Coppin State University, Morgan State University, and Sojourner-Douglass College all call Baltimore home. The institutions between them are home to almost 12 000 students. According to Popular Mechanics, “One thing that helps all startups in Baltimore—a low cost of doing business, including reasonable rents.” A low cost of business is vital, especially for African American entrepreneurs who are not likely coming from deep family pockets or may lack access to capital via investor networks or bank loans. Under Armour, which was launched in Baltimore three years after graduation by former college football player Kevin Plank. It has grown to become one of Nike’s thorns in less than twenty years and has made Plank a multi-billionaire. It has also allowed him to become one of his colleges biggest donors and boosters. The city has also produced two notable HBCU owned media companies. One, Carter Media Enterprises founded by Morgan State University alumnus Jarrett Carter, Sr., owns HBCU Digest and has been at the vanguard of a new generation of HBCUpreneurs. The city’s Emerging Technology Centers also has been vital according to Popular Mechanics, “In 15 years the business incubator and accelerator has aided more than 350 companies that have attracted $1.6 billion in investments.” In other words, Baltimore is booming. HBCUs and the cities they are in must and should take similar steps to creating incubators within their town. Baltimore HBCUs really have an opportunity to make a splash with 12 000 students if they created a joint incubator. Schools like Texas A&M have even gone so far as to start a program called Startup Aggieland, which per their website, “student startup offices and co-working spaces for student collaboration, as well as free business resources, professional training and networking events.” The university does not take any equity in these businesses or their intellectual property, but by offering them the space they know if any of them are successful there is a strong chance that these students will become high-quality or transformative donors. Something all HBCUs desperately need. It also gives these students work experience before graduations, which is becoming even more of an issue for many graduates entering the work force. These incubators and ecosystems must also take advantage of geographic and academic strengths. HBCUs in the DMV should be focused on government and defense related entrepreneurship or more specifically in Baltimore, the STEM research being conducted at America’s largest research institutions, John Hopkins. Nosy around and see what research they are developing that may have commercial application. Or if your HBCU is an 1890 school, focus on agricultural businesses. Gulf coast HBCUs should definitely be looking at aquaculture given its recent boom. Again, we have to push this as not only important, but absolutely strategically vital to our long-term survival and success. From big cities to small towns, HBCUs should be engaged with their civic counterparts to see how they can create opportunities for their students to engage the role of owner, founder, and entrepreneur. It is vital that we create a stronger HBCU private sector that can grow enough companies and actually provide wealth creation, more immediate employment for graduates, and opportunities to start their own companies. It is also crucial that alumni play a role in this as well. Either through creating an endowment that can give the school monetary funds to award to students who engage in on-campus HBCUpreneurship or if they are HBCUpreneurs themselves providing time to mentor budding HBCUpreneurs at their alma mater. Capital is ultimately the KEY component that can unlock a lot of HBCU startup potential. Without it, these are just fancy cars parked in the driveway with no gas. We beat this horse constantly, but this is where the advent of the HBCU Credit Union would be extremely vital in HBCU startups accessing capital. At this points we have three options: innovate, stay on life support, or die. Detroit, Michigan, home of Lewis College of Business, ranked number thirteen on the list. An HBCU and city badly in need of a makeover. Austin, Texas, home of Huston-Tillotson College, ranked number fourteen on the list. An HBCU that sits in the looming shadow of the state’s largest public institution. Dell is based there and Twitter made its public debut at the SXSW Interactive festival that is held annually there. How many HBCU owned airlines are there in America? Zero. How many African American owned airlines are there in America? Zero. In Africa, the story is quite different with a number of airlines popping up over the past five years in the ownership hands of native Africans. So it appears we have some catching up to do with our brethren in the motherland. 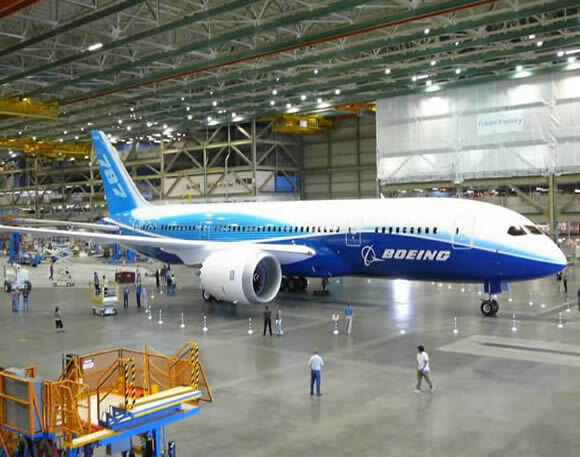 Given HBCUs are often flush with engineering talent, one HBCU owned airline alone could create massive job opportunities. 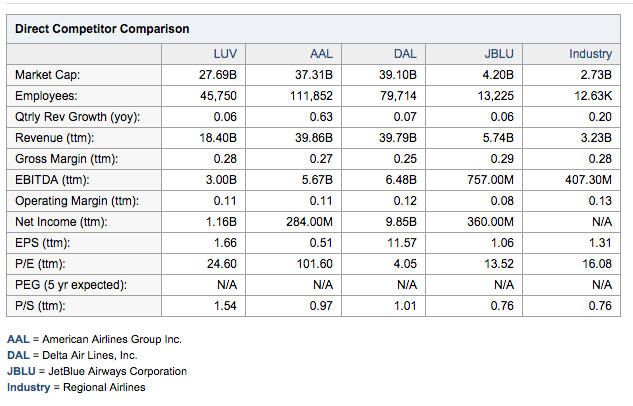 Jet Blue employs almost 14 000 people and is one of the smallest low fare regional airlines, while one of the bigger regional players Southwest Airlines employs almost 50 000. However, starting an airline is not for the faint of heart and maybe one of the hardest entrepreneurial challenges one can take on. Boeing’s airline startup page says, “Few businesses have as many variables and challenges as airlines. They are capital-intensive. Competition is fierce. Airlines are fossil fuel dependent and often at the mercy of fuel price volatility. 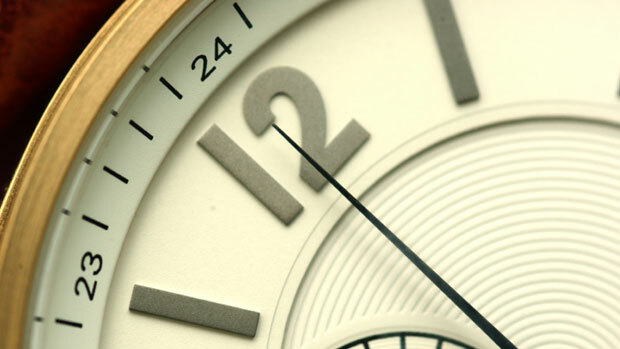 Operations are labor intensive and subject to government control and political influence. And a lot depends on the weather.” However, if you are up to the challenge of finding a niche in the space, then you are on your way to creating a multi-billion company since the industry average of value is $2.7 billion (below) according to Yahoo Finance.